In Dutch oven or large saucepan, combine eggs and enough cold water to cover. Bring just to a boil. Reduce heat to medium-low; cook 15 minutes. Drain; rinse with cold water to cool. Remove shells from eggs; halve lengthwise. Carefully remove yolks; place in medium bowl. Set white halves aside. Mash yolks with fork. Add dip and chives; mix well. Lightly spoon yolk mixture into egg white halves or pipe in using decorating bag. Refrigerate at least 1 hour or until serving time. Garnish as desired. 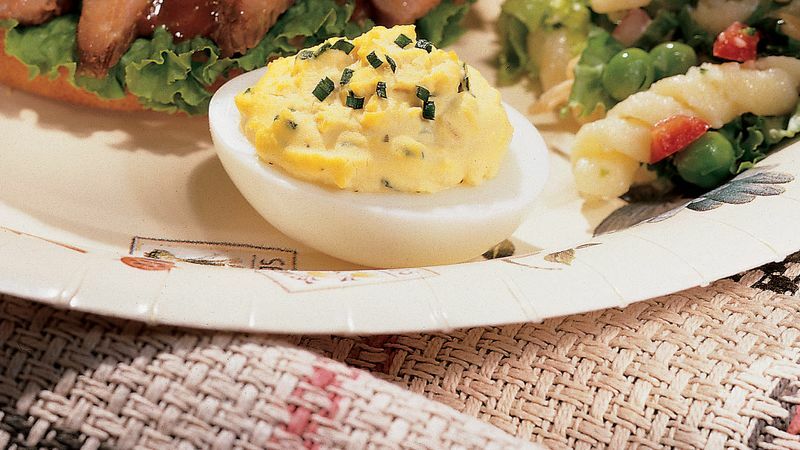 Give your deviled eggs a different taste by using another sour cream dip such as Bermuda onion in place of the French onion dip. For another flavor twist, try dill dip, horseradish-bacon dip or taco dip. To peel hard-cooked eggs, crack them by tapping them gently in two or three places and place them in a pan of cold water. This allows cold water to penetrate and to shrink the egg from its membrane for easier pealing. The quick cooling also minimizes yolk discoloration.